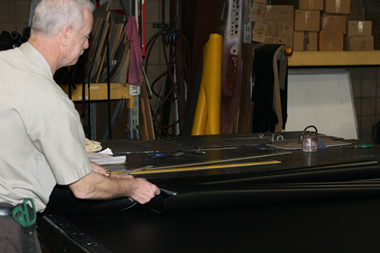 The Tarpco Tarp Shop has been manufacturing custom tarps for over 70 years. We don't buy tarps to size, pull them off a shelf and put them on your trailer. We buy the best quailty materials, measure your equipment and setup and make your tarp to those specifications. The better a tarp fits, the longer it will last and the better it looks. We custom fit the tarp to your trailer. 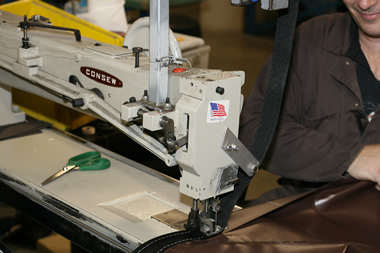 With a combined experience of over 150 years, we take pride in each and every tarp we put on. We take pride when we see you drive away from our shop. 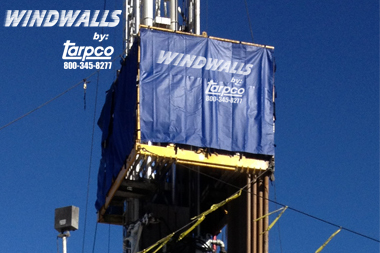 Protect and shield your rig workers from severe weather conditions by using WindWalls exclusively manufactured by Tarpco. Every WindWall we manufacture features heavy duty 22oz. material, custom made for any size rig, sequentially numbered for fast and easy installation at the work site and adjustable release buckles for maximum security and safety. No one sews a tarp like Tarpco. Period. © 2008-2014 Tarpco. | This page rendered in 0.00355 seconds.